Are The Bees Dying Off? In 2007, the environmental world was shocked by massive bee deaths, mainly colony collapse disorder (CCD), where the bees in the hives disappeared completely. 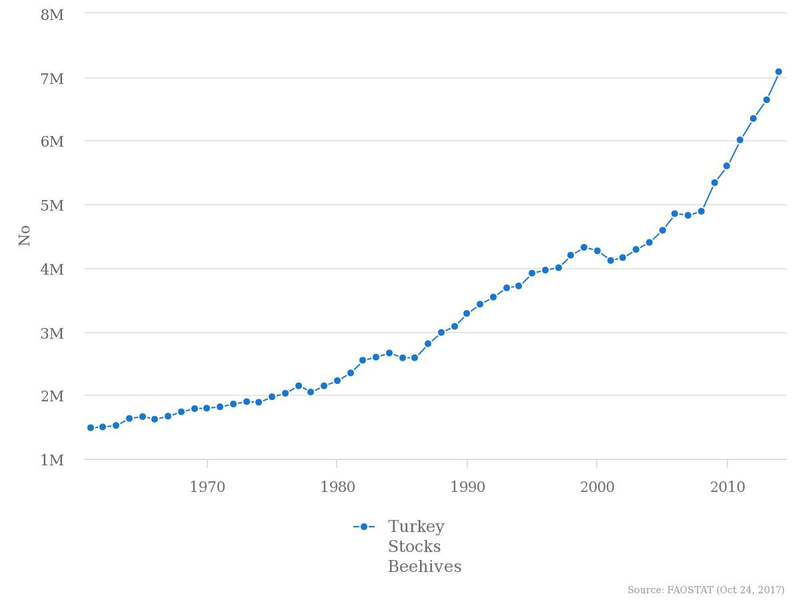 Although there are not very reliable statistics about hive loss in Turkey, Uludağ University shared information about the percentage of loss in bees increased from 10-20% to 70%, an alarming rate. However, thanks to government aids and increasing interest in beekeeping and honey producing, it seems like the total number of hives are not diminishing but increasing as in this graph. Trying to read what is going on with the bees just by looking at numbers may be misleading. As in the case for Turkey, many hives may be lost because of several causes (you may see on the link), but even more are added. The bottom line is, there are more than one environmental factor that affect the bee health and none seem to be going in favour of the bees. We need to do whatever we can to change whatever factor we can in order to help the bees. When something has multiple causes, it’s usually the case that those causes are interrelated in complicated ways; it’s not necessarily as simple as shutting down one or two of them and the whole problem melts away. A simplified example is the ongoing mass die-off of coniferous trees due to bark beetles. There is one cause, but it needs two legs to stand on. Bark beetles are endemic to conifers, but it is the continuing drought that causes the trees to be susceptible. Without the drought, the trees fight off the beetles. Without the beetles, the trees could weather the drought. But put them both together, and they form a threat that the trees cannot defend against. This is probably thematically similar to what the bees are going through. Biologists have found more than 150 different chemical residues in bee pollen, a deadly “pesticide cocktail” according to University of California apiculturist Eric Mussen. Furthermore, wild bee habitat shrinks every year as industrial agribusiness converts grasslands and forest into mono-culture farms, which are then contaminated with pesticides. To reverse the world bee decline, we need to fix our dysfunctional and destructive agricultural system. A European Food Safety Authority (EFSA) scientific report determined that three widely used pesticides — nicotine-based clothianidin, imidacloprid and thiametoxam — pose “high acute risks” for bees. The nicotinoid pesticides—used in soils, on foliage, and embedded in seeds—persist at the core of the toxic pesticide cocktail found in bee hives. The three neonicotinoids act on insect nervous systems. They accumulate in individual bees and within entire colonies, including the honey that bees feed to infant larvae. Bees that do not die outright, experience sub-lethal systemic effects, development defects, weakness, and loss of orientation. The die-off leaves fewer bees and weaker bees, who must work harder to produce honey in depleted wild habitats. These conditions create the nightmare formula for bee colony collapse. On 23 March 2017, the European Commission has presented to the Member States its draft regulations to ban neonicotinoids. A vote by Member State could take place in May. In the frame of the Comitology process, the European Commission is presenting, in the Standing Committee on Plant, Animal, Food and Feed, 3 draft regulations to ban the 3 bee-killing neonicotinoids in the entire EU. Imidacloprid, Clothianidin and Thiamethoxam would not be authorised with an exception for permanent greenhouses that are supposedly completely closed systems. When the European Commission (EC) restricted the 3 neonicotinoids in 2013, the producers (Bayer for imidacloprid and clothianidin and Syngenta for thiamethoxam) were requested to provide the EC with socalled ‘confirmatory data’ by 31 December 2014. Based on these data, the European Food Safety Authority (EFSA) has carried out a peer review and updated its risk assessment . The information provided by Syngenta was not sufficient to improve the risk assessment and the majority of the risks could not be characterised: ‘high risk cannot be excluded’ concluded the EFSA. On the other hand, the agency identified new high risks to bees concerning Bayer’s clothianidin and imidacloprid. The high risk posed by these 3 chemicals is linked to the fact that they are the most potent and systemic insecticides ever produced by agrochemical industry. They are persistent in soils. Because they are systemic, the soil residues are absorbed by succeeding crops as well as by flowering weeds adjacent to the treated crops. They contaminate water streams and can now be found anywhere in the environment. Wild flowers’ nectar is contaminated as well as rain water! Martin Dermine, PAN Europe’s pollinator project coordinator said ‘Neonicotinoids have been decimating honey bees as well as wild pollinators in Europe for more than 20 years. This proposal from the Commission is a first step for the recognition of this long fight for environmentalists and beekeepers. The amount of scientific evidence on the toxicity of these insecticides is so high that there is no way these chemicals should remain on the market. This is not precaution anymore: it is prevention to avoid prolonging this environmental disaster.